"These Elrathia Kingi Trilobites are about 1 inch long. They have the librigenae or free cheeks attached. These parts are usually lost during molting and break off easily upon death. 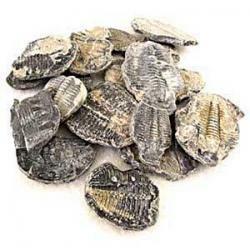 Because of this trilobites with cheeks complete are much more rare. They come from Utah and were found in the Wheeler Shale in Millard County, an area well-known for its trilobite species.This is a sample of our inventory. Each piece is different but all are comparable to the ones in the picture."